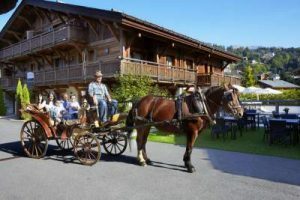 Group Parties Accommodation in France French Large Parties Take A Break Holiday suitable for Extended Families for big occasions Reunions. Located in a 7-hectare park, 20 km from Honfleur and 5.4 km from Deauville, Les Manoirs de Tourgéville features a large indoor swimming pool, tennis court, a cinema and a well-being space. There are 2 people looking at this hotel. More The hotel consists of a main building and five timber Norman manors. It offers light, spacious rooms, and apartments, all equipped with satellite TV and minibar. Bathrobes are provided and some accommodations overlook the park and feature a private terrace. Traditional cuisine can be enjoyed in the evening in the panoramic restaurant, Le 1899. A buffet breakfast is served daily. You can also choose to have dinner or lunch at the Lounge Space. 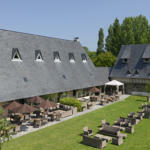 Les Manoirs de Tourgéville provides free Wi-Fi access and free public parking. Bicycle rental is also available on site. Each self-catering apartment at Residence Le Bois Flotte includes a fully equipped kitchen with oven, dishwasher and electric kettle. You will also find a dining area and a living room with an LCD TV. Barbecue facilities are at your disposal on site and a private terrace with pool view is available for all of the apartments. A free baby kit including baby cot, bath, changing table and bottle warmer can be requested at the reception. 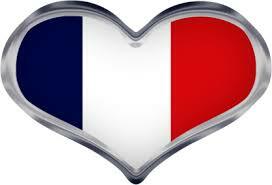 You can play golf 3 km away or do water sports 500 metres from Residence Le Bois Flotte. Cabourg is 5 km away and Deauville is 30 km away. Caen Train Station is a 20-minute drive away. Score from count”252 reviews: Very good 8.1 Latest booking: 19 hours ago There are 2 people looking at this aparthotel. The studios and apartments have are equipped with flat-screen satellite TV, a balcony and bathroom with bath or shower. The kitchenettes have a microwave, dishwasher and refrigerator. There is also a coffee maker, kettle and hot plates. Breakfast has been designed by the Pourcel Brothers chefs and includes Lucien Georgelin artisan jams, fresh fruit, pastries and hot dishes. Fresh organic fruit juice and Løv Organic teas accompany the meal. Guests can enjoy traditional Savoyard specialties in the hotel’s restaurant, Le Duplex, which is open during winter season. For guests visiting the area to ski, equipment can be reserved in the hotel. 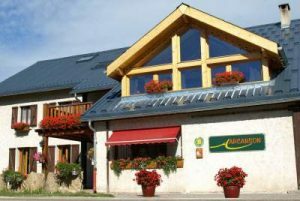 In the Vercors Natural Regional Park, Arcanson sits in a renovated farm house with a garden, free ski storage and free Wi-Fi. A hot tub, sauna, massages and Shiatsu treatments are available upon reservation, at an extra cost. The guest rooms feature mountain views, wooden-panelled walls and a wardsrobe. They also have a private bathroom with shower. Every morning, guests can enjoy organic jams, local honey and cereal bread for breakfast. Meals and packed lunches can also be prepared by the host upon request. Ski equipment hire and bicycle rental can be arranged on site. Grenoble Train Station is just 35 km away and Grenoble Airport is 67 km away. Free private parking for cars and motorbikes is available on site. Group Parties Accommodation. Take A Break Holidays takeabreakholidays. Group Parties Accommodation.